Aphrodite (Venus to the Romans) “Capitoline Type”. 2nd centuryAD Roman statue in marble discovered at the Acqua Traversa near Rome. The statue belong to a series of Roman replicas of a Greek original that reproduce a famous picture of goddess Aphrodite (Venus) and the best known copy is in the Capitoline Museums in Rome. 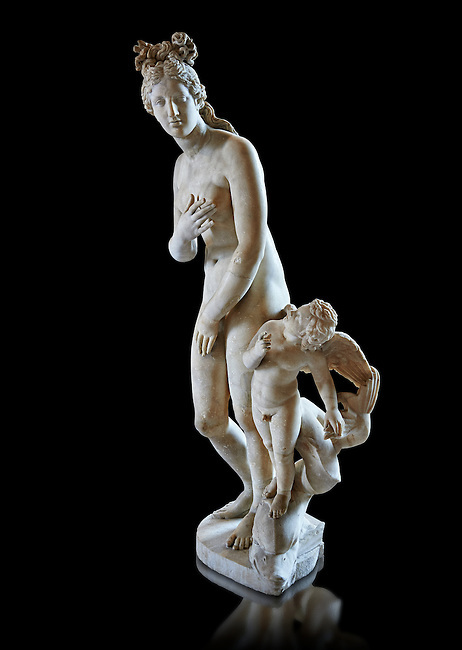 The now lost, the Greek original dates from the 2nd century or 3rd BC and is known as the "Aphrodite of Knidos” in which Aphrodite accompanied by a cupid is surprised while bathing. Inv MR 369 (or Ma 335), The Louvre Mueum, Paris.